Registration for the Organ Grinder opens April 1st ... no joke. 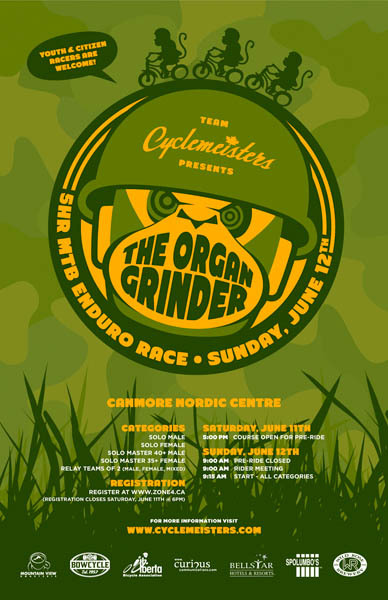 The Organ Grinder 5hr Enduro returns!!! In 2010 nearly 250 of you signed up and told us that the Organ Grinder was one of the best races you've ever attended. Well we're back ... same course, same b.b.q., and the same atmosphere will grace the Canmore Nordic Center on Sunday, June 12th. We're pretty certain that we're going to have more of you sign-up this year so we've restricted the numbers to 400 total racers so sign up early. Full race details and links to accommodation in Canmore can be found at www.cyclemeisters.com. See you there.